The return of the business cycle is not about where we are in the cycle, but about what’s driving the cycle and what it might mean for investors. For the majority of this economic cycle, accommodative monetary policy has supported growth and the markets have relied on central bank intervention to keep the expansion going. We’ve already started to see a directional change by the Federal Reserve (Fed), coupled with companies’ increased need to focus on growth, resulting in a new dynamic for business leaders and investors. • Fiscal coordination, with some combination of infrastructure spending, tax reform, and regulatory relief. Given recent progress on the policy front, we expect corporate tax cuts to be a primary contributor to economic activity in 2018. • Business investment in property, plants, and equipment. Companies are using cash differently now, focusing on increasing productivity and attaining greater market share. • Earnings growth, supported by better global growth, a pickup in business spending, and potentially lower corporate taxes. • Active management, which should see continued momentum thanks to a return to fundamental investing, where investors can determine winners and losers based on earnings, sales, cash flow, and so on. Against this backdrop, we expect economic growth — as measured by gross domestic product (GDP) — of 2.75%-3.0%, thanks to fiscal support, a pickup in business spending, and steady consumer spending. We forecast returns of 8–10% for the broad stock market (as measured by the S&P 500 Index), with earnings growth the primary driver. And given our expectations for a gradual increase in interest rates, we expect flat to low-single-digit returns for bonds, as measured by the Bloomberg Barclays U.S. Aggregate Bond Index. We believe bonds remain an important part of a well-diversified portfolio, however, particularly in the event of stock market pullbacks. We believe this return to the business cycle has the potential for success, where investors may be rewarded for their ability to focus on business fundamentals. However, an aging expansion and a leadership transition at the Fed may increase the likelihood that stock market volatility picks up in 2018. As always, we emphasize maintaining a long-term perspective and a well-balanced portfolio. 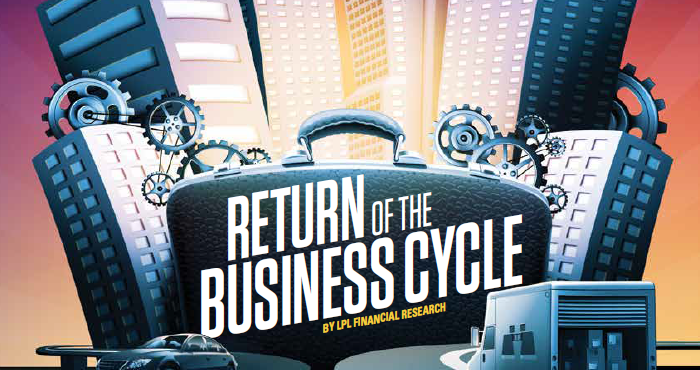 The LPL Research Outlook 2018: Return of the Business Cycle provides insightful commentary to help you navigate the year ahead. If you have any questions, please contact your financial advisor.